obsessed with knitting: are socks boring? Before I started knitting socks last year, I got tired of reading posts about socks. I couldn't really relate. But now here I am of course, posting about socks. And I still think they're a little boring to read about, if not to knit. But getting back to socks, there is only so much you can do to make a sock both wearable and interesting. They all require patterns that fit the requirements of leg and instep in the round. Cat Bordhi does have some interesting -looking approaches in her New Pathways for Sock Knitters book, but I haven't tried them yet. It is almost hard to find solid colored sock yarn - that is how popular handpainted yarns are. And using fancy variegated yarn is one way to make socks more interesting to knit. 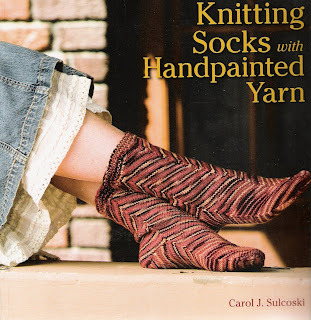 This book seemed to promise insight into the special qualities of variegated (not necessarily handpainted) yarn and how to make the most of it. But I was disappointed. There is nothing here inaccessible to common sense, like don't pair an intricate lace pattern with an intensely colored, busy variegation. Carol Sulcoski's explanation of how variegations are developed (short color intervals, longer intervals, etc.) is pretty common knowledge, or else readily available elsewhere. Her best idea, to break up the colors by using chevrons, is one that I have seen over and over again. It is illustrated on the cover. Unfortunately, I had to buy this book because it was not available through my library system, and I really wanted to see it. Sulcoski offers 21 sock patterns from various designers, some quite nice. But here is a problem I have with ready- made sock patterns: they don't come in your exact size, and I don't think it's worth it to play around with needle sizes and math to engineer them. For example, only 11 out of the 21 sock patterns here came in the foot circumference I need for myself, and I'm being flexible. And, I don't have unusual-sized feet at all. I'll just continue to use Charlene Schurch's or Priscilla Gibson Robert's sock formulas that can be used for any size and almost any stitch pattern. A good case in point is this finished object - socks with a 10 inch foot circumference, a size you won't find in any ready-made pattern with the possible exception of Nancy Bush's vintage socks book. These babies took 3 skeins of Knit Picks Risata, a wool/cotton blend with a little elastic added to counteract cotton's lack of elasticity. This yarn is not as soft as wool and it's also a little too thick for me. I don't think I'll use it again, especially since all wool is as comfortable in summer as advertised. 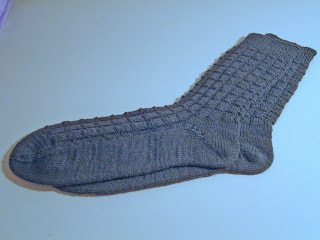 The pattern is Swedish Block, a six-stitch pattern from Schurch's More Sensational Knitted Socks. The heel is short row, and the toe is Schurch's standard, with decreases running up the sides. Thanks to Anne for the wonderful baby posts and pictures of Rosie. I'll have another one in the next post. I had a feeling that book wasn't going to be terribly helpful. Thanks for the confirmation. And yay! for more Rosie pix. She is soooooo cute. From me, too, thanks for the review. I came sooo close to buying that book the other day. I'm glad now that I decided I don't need another sock book. I am losing interest in wildly variegated sock yarn. I wouldn't buy bright socks if I were shopping for socks, so why knit them, even if they are fun to knit. I was glad to see more sedate sock yarns on the shelves of my lys the other day.